This was supposed to be the year that the Bears got over the hump and qualified for the NCAA Tournament for the first time since 2011. After some highs and many lows, though, Cal ended the season in a mirror of last year: a loss in the first round of the conference tournament. The action got started immediately. On Maine’s first penalty corner of the game, the initial shot was blocked, but Maine forward Brianna Ricker tipped it in on the rebound for the first score of the game. And when Rodgers isn’t dominating on the field, Cleat says she’s just another girl who enjoys watching Netflix and loves country music. Action kicks off today with a matchup against Maine (14-4), which comes into the tournament ranked No. 18 nationally after a second-place finish in the east division of the America East Conference. The Black Bears boast a high-powered offense that ranks No. 4 in the nation with 3.78 goals per game. For seniors Moore and Sakkas, Sunday marked the end of a wild journey at Cal. The two have both appeared in each of Cal’s 70 games over the past four seasons, combining for 45 goals. The Tigers (9-7, 3-2) are paced on offense by senior forward Kriekie van Wyk, who has scored 15 goals on the season, good for 10th in the country. On Sunday, in Pacific’s 4-0 win over UC Davis, van Wyk notched a hat trick in the first 15 minutes of play. 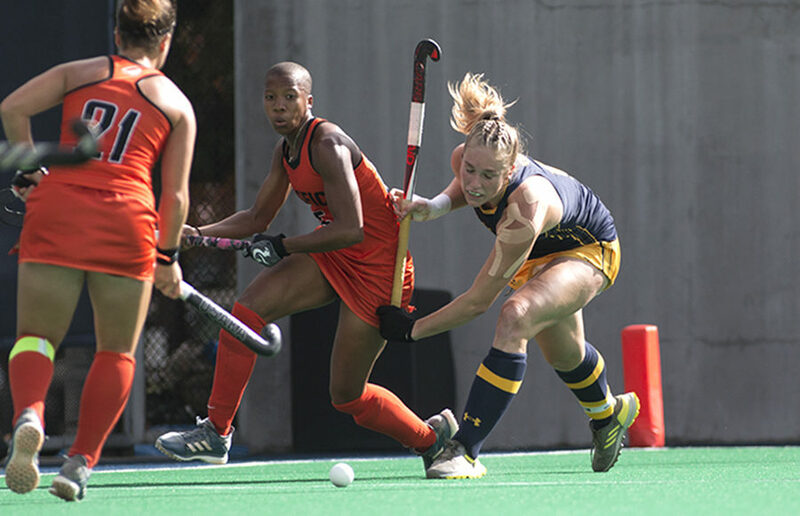 While they probably weren’t talking about the Cal field hockey team, the Bears experienced a repeat of last weekend with a shutout win over UC Davis and another 3-2 loss to Stanford. Sunday will be redemption day for the Bears, as they get a rematch against the Cardinal team that they lost to in disappointing fashion last week. In the end, Cal fell 3-2 with a familiar storyline: missed opportunities resulting in a disappointing loss.